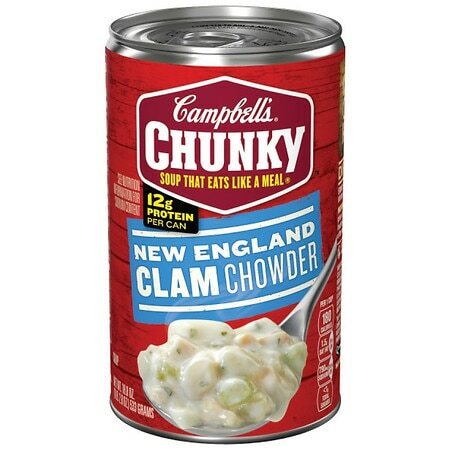 Campbell's® Chunky¿ New England Clam Chowder isn¿t just about taste¿it really satisfies too! Rich and flavorful, you can taste the authenticity of its East Coast recipe in every bite. Kick up it up a notch by pouring the hearty chowder into a bread bowl. Satisfaction guaranteed. Please have code and date information from container. Metal edges are sharp. If using can opener, open bottom of can.